The following list contains information about programs that train students to become ophthalmic medical technicians. Search for ICA accredited programs with the link below. The International Council of Accreditation (ICA) is responsible for evaluating ophthalmic training programs sponsored by colleges, universities, community and junior colleges, vocational-technical schools, academic health centers, proprietary institutions, hospitals, and clinics. ATPO, IJCAHPO, CSOMP, and COTP cooperate to establish, maintain, and promote appropriate standards of quality for educational programs for the ophthalmic medical technician and to provide recognition for educational programs that meet or exceed the minimum standards outlined in the Standards. 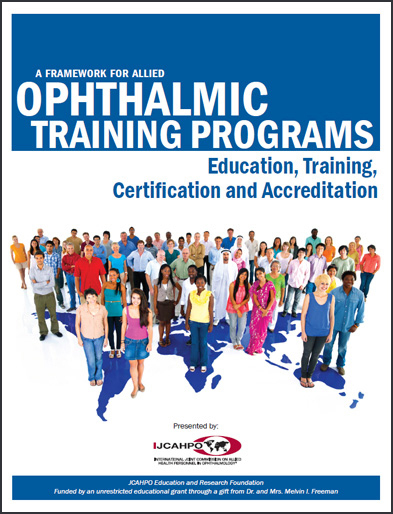 Introducing "A Framework for Allied Ophthalmic Training Programs." This long-awaited publication is a critical reference guide that is of great need and interest in the ophthalmic profession. This reference guide will be used to help organizations worldwide in starting an ophthalmic assisting training program, understanding the role and differences of certification, licensure and accreditation, and to provide a quick tool for reviewing curriculum and certification examination content. It also includes a sample schedule for developing classroom and clinical training.